Low growing dense bushy evergreen with rounded, thick, leathery, dark green leaves which are reddish tinted when young. 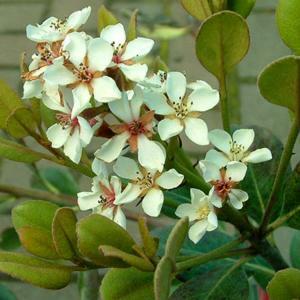 Fragrant, hawthorn-like, sometimes pink-tinged, white flowers in summer, followed by small bluish-black berries. Moist well drained soil in sun or part shade. Best in a protected position with shelter from cold, drying winds. Good near the sea, tolerant of salt spray. Native to Eastern Asia and Japan. Often found growing in thickets near the coast.